Moby Line’s Zaza can carry up to 1400 passengers and 450 vehicles on each of its voyages. 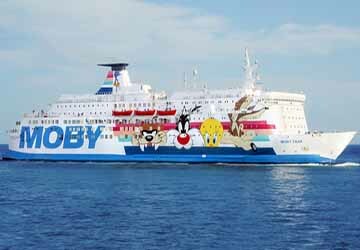 Decorated in Looney Tunes livery, the large amount of facilities and amenities on board this ship cater for both young and old travellers. There are 300 cabins with a choice of specification. The ship comes with a huge range of eating options, Wi-Fi, phone chargers, a great selection of bars and a children’s area for young voyagers. Read below for more information. The Moby Zaza has 300 cabins with private facilities included. Travellers will be able to pick from a large range of cabins, varying from double to quadruple rooms. These can be outside rooms with or inside cabins without a porthole, depending on your preference. You don’t have to be separated from your furry friends whilst making your journey with pet friendly cabins available on board. Savour the authentic taste of a traditional Italian pizza at the on board pizzeria. You can even do it in the company of your favourite Looney Tunes character. The à la carte restaurant provides expert chefs producing the finest Mediterranean cuisine alongside a huge selection of great wine. For a selection of delicious dishes cooked daily head to the self-service restaurant. You’ll also find an extensive range of food options for children too. If you don’t want a full meal and just want a quick bite to eat or drink, the Snack Bar and Coffee shop has you covered. Here you’ll find a wide range of hot and cold snacks, coffees and beverages. Fancy a relaxing setting to enjoy a cocktail or two? Sip away at the Piano Bar and Show Lounge and have the perfect evening with your partner and friends. A hot day on a ferry calls for one thing, ice cream. The Gelateria is the perfect way to cool down with a summery gastronomic delight. If you need some holiday essentials, souvenirs or just want to treat yourself you’ll find what you need in the ship’s shop. You can also benefit from better than high street prices in the winery, go and try the excellent range, including some of the best Italian wine around. There’s no reason to leave your beloved pet behind with on board kennels. Your pet will be safely looked after whilst you enjoy the ship’s services yourself. The vessel has Satellite SKY TV installed so you can catch the live sport or latest television whilst your on the move. Totem charging stations are located on board and Wi-Fi connection is also available. This means there is no need to lose contact with what’s going happening on dry land and you can keep in touch with friends and family. The youngsters will have plenty to keep them busy. Children’s World is equipped with video games and there is also a separate play area. Please Note: Whilst we have taken great care in making our Moby Zaza guide as accurate as possible, onboard facilities, services and entertainment may vary depending on the date and time of year that you travel, facilities mentioned may change without notification and ferry companies reserve the right to operate vessels other than those mentioned at time of booking without prior notification.